Kailua Kona, on Hawaii's Big Island, is a popular year-round cruise destination offering extraordinary weather (12 different climates on the island!) and stunning landscapes. Cruise ships dock off shore and passengers are ferried on tender boats from the ship and disembark at the Kailua Pier. The pier is in the centre of Kailua town, which has good restaurants and shops. Within easy reach of Kailua, cruise passengers can explore Big Island's tropical rain forests, the frozen tundra of Mauna Kea, and the arid Ka'u desert. An array of activities, from snorkelling to snowboarding, are also available for visitors on the island; there are water sports operators at the Kailua Pier. Tourist information is available from a booth at the pier, and there is also transport and tours available for cruise passengers. The pier is within easy walking distance of the town. 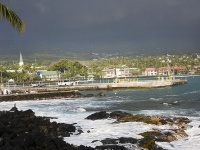 Kailua Kona port is located in downtown Kailua and visitors can walk into town from the wharf. There are taxis, as well as free shuttles to Hilo Hatties, KMart and WalMart, available from the pier. Rental cars can be hired in town but driving off a paved road is prohibited. Bicycles can also be rented in town. One of the main attractions of Big Island are the beaches, the sand tones varying from white to red, black and green. The beach closest to Kailua Kona port is Kamakahonu Beach, which can be reached on foot. Passengers may be lucky enough to watch a bit of Hula dancing at a beach luau, frequently arranged by cruise companies. The Ellison S Onizuka Space Centre, named for the Big Island astronaut, is also a popular attraction. Built in 1883, the Hulihe'e Palace mansion was the former holiday residence of the Hawaiian royal family, another sightseeing must. Ali'i Drive is the main shopping destination in Kailua, with a variety of shops selling everything from T-shirts, sunglasses and jewellery to local souvenirs or arts and crafts. The Coconut Grove Marketplace and the Ali'i Gardens Marketplace are also worth browsing, featuring extraordinary finds such as traditional weapons or local coffees and nuts. Wal-Mart and K-Mart are also located nearby.